Find out why we feel cheated after upgrading our upright fridge-freezer to save energy and for more freezer space. Selecting an energy-efficient replacement fridge/freezer, that actually does what it says on the tin, proved more challenging than it should have been. Reliable, nice features such as bottle rack and freezer door alarm, but infuriatingly over 30% more energy consumed than the brochure indicated; I feel deceived. More space, half the power of our previous smaller fridge/freezer, auto-defrost, with useful fridge-above-freezer arrangement to minimise bending down. Our old upright fridge/freezer was a Zanussi "ZFC 62/23 FF" bought seven or eight years ago and still working OK. However, at ~2kWh/day electricity consumption out of a house total of 7kWh, and given that we wanted a bit more freezer space, and given that we'd just put up a solar PV microgeneration system on the roof that our old machine would consume the entire output of, we decided that it was time for an upgrade. The Zanussi gross fridge and freezer capacities were 175l and 65l respectively (170l and 50l net). The Zanussi had a nominal 1.7kWh/day power consumption. though it was measured to be 2kWh/day with a PM230 plug-in power meter. Energy Savings Trust approval, A-or-better rating, and <1kWh/day. Over 90l freezer gross capacity and ~170l fridge gross capacity. Frost-free freezer and auto-defrost fridge. Upright, free-standing, ~60cm width, preferably white. No silly gadgets that we'd never use, such as high-capacity ice-makers, drinks dispensers, etc. We didn't like anything that we saw to start with, and initially hoped that we might find something in the £350 range. We checked out John Lewis and Waitrose, Boots, Currys/Dixons, Argos, various on-line price-comparison sites (though I loathe them), etc, etc, over the course of a few weeks. Very few sites allowed us to sort or filter by energy consumption nor in particular by Energy Savings Trust approval. None filtered by capacity, which is daft, and would have saved much time and effort. Descriptions and ratings were largely consistent and clear, though Argos claims one of their appliances would use 0.88kWh/year, which would be miraculous! Retailers: please allow sensible sorting and filtering! The John Lewis Direct site, from which we bought in the end, was nothing special but it worked. John Lewis in general is a well-run ethical company that we often use (disclaimer: and for which I worked part-time as a teenager). Apart from anything else we were happy to let them take away our old fridge for recycling, trusting them not to fly-tip it for example! Their £9 disposal charge was a little higher than some others', but the delivery charge was zero, and the appliance price of £524 OK.
You'll gather that we couldn't get frost-free and 90l+ freezer capacity and a decent fridge capacity and a brand with a good reputation for £350. Never mind with a supplier that we'd dealt with before and trusted. So the JL and Siemens brands were very helpful in that respect, and being able to look at the Siemens appliance in our local John Lewis department store in Kingston was also confidence-building. 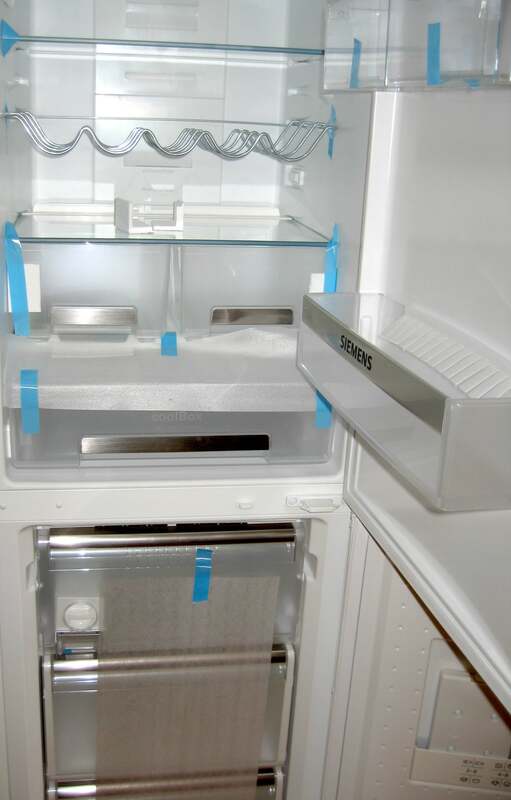 The Siemens gross fridge and freezer capacities are 186l and 109l respectively (186l and 88l net), and a nominal 0.75kWh/day power consumption. One thing that the extra freezer space will be used for is about-to-expire supermarket bargains that loss-lead rather than land-fill, and bulkier items such as bread. As of the first week of use I had not yet observed a consumption as low as the specified 0.75kWh/day (though not over 1kWh/day either), which is disappointing, and as of July/August I was seeing a typical usage of ~1.1kWh/day or a little over measured three different ways, so an engineer has been to check over the appliance, and thinks that possibly the auto-defrost is not doing enough, thus making the cooling less efficient. I will try to test this theory by completely defrosting the entire fridge/freezer with power off over a couple of days, and seeing if it reverts to a lower daily consumption afterwards. If so, we may need to fix the defrost mechanism. The appliance was left off from 2008/08/28 17:20 BST to 2008/09/01 07:50 BST, with the doors and drawers open as appropriate to allow a full defrost. 'After' measurement: in the 24 hours (+18m) up to 2008/09/02 17:38 BST the fridge/freezer consumed 1.15kWh. In the next 24 hours it consumed ~1.07kWh. In the next 48 hours it consumed ~2.05kWh (to a total of 4.56kWh over 48h). In the next 72 hours it consumed ~3.18kWh (to a total of 7.74kWh over 168h). After some more visits and measurements, and unsatisfactory talk from Siemens' tech staff suggesting that the figures that it publishes/advertises are meaningless non-real-world lab values and that Siemens doesn't intend to stand by them, and me pointing out that trading standards officials might take a dim view, and some final fiddling around and addition of sealant in strategic places, as of a coldish 2009/02/03 some time after the last engineer visit the appliance seems to be consuming a shade under 0.9kWh/day. Over the course of nearly two weeks consumption was more like 0.91kWh/day. Not what was advertised, and I'm not entirely happy, but I'll live with it, given that it's just at the edge of believable error from the meter (~10W). But I may well never buy another Siemens appliance. 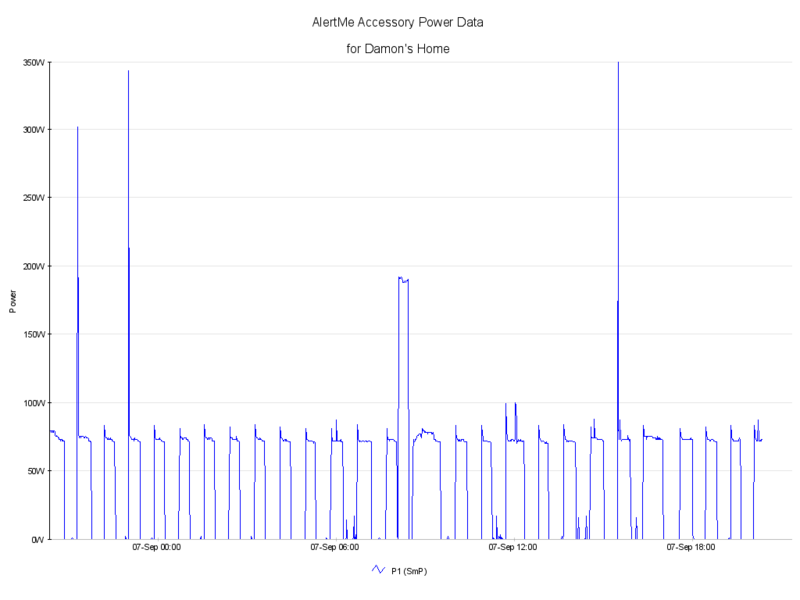 See the above graph and .csv spreadsheet/data of 1 minute samples by an AlertMe monitoring system for 2011/09/04: mean 42W (1.02kWh/d), max 356W, typically 0W or 75W. Over more than a month (2011/09/04 to 2011/10/14 inclusive) the mean consumption was 42.5W or 1.02kWh/day. There is a possible slight downward trend with the cooler weather, with the lowest day's consumption being seen on 2011/10/12. The right-hand-side fridge lamp expired and was replaced with a Philips 5W LED (E14 pygmy) lamp for £5 from John Lewis 2018/12. The left-hand-side lamp is one of the few incandescents left in the house, the oven being an honourable exception. 2017/06/22: Home electrical appliances using more energy than stated: "It seems that there are some big discrepancies between testing under laboratory conditions and when products such as TVs and dishwashers are used in the real world; and the news comes on the back of recent suggestions that manufacturers are learning how to ‘game’ the system." 2017/06/21: Domestic appliances guzzle far more energy than advertised – EU survey. In echo of ‘defeat device’ scandals, one TV increased energy consumption by 47% when tested in real-world viewing. See the Siemens Domestic Appliances site. The John Lewis Direct site.